Hot and sunny days mid April finally bring out the plum blossom. The tulips are a new variety for this year - irresistibly called Disneyland Paris. The daffodils are also a new variety for this year "Narcissus Acropolis"
Plenty of beds now await the summer planting. A cruise around the Hawaiian islands is not the easiest place to get to from the UK. Its a long journey and it is not often one finds anything anywhere near a bargain to get you there. As usual we arranged our own flights taking advantage of Air New Zealand's route to Auckland which stops in Los Angeles and is great value and features the skycouch (more on that later). Only problem is it leaves from Heathrow so a flight from Manchester to London would have to be added on. All flights were on time - its a supposedly 45min flight from Manchester to Heathrow but in reality its more like an hour or more by the time you add taxiing time and circling Heathrow waiting for a slot. Never ever fly to Heathrow with tight connections especially if you need to switch terminals which can be another hour on bus shuttles (been there done that - never again). We left Manchester at 9.05am on a British Airways flight that drops us at Heathrows T5. 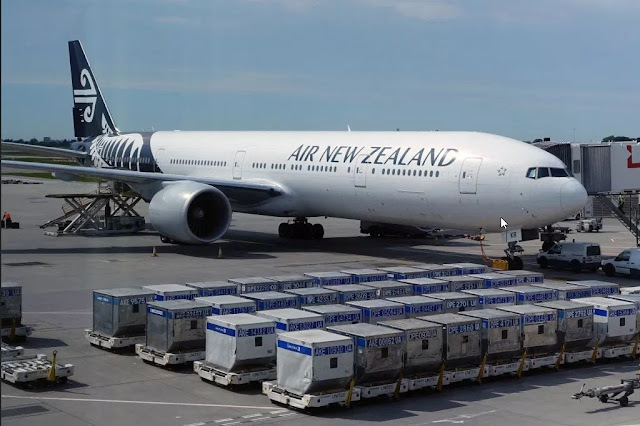 Our luggage is checked all the way through but we will have to pick up boarding cards for the Air New Zealand flight to LAX which leaves from T2 later this afternoon at 3:20. This sound like a lot of time but in reality its almost lunch time before we have passed security again in T2 and are sat down for a relaxing lunch and wine in a restaurant. Air New Zealand leaves on time and we have a 10hr 30min flight to LAX. Compared to other airlines I have to say Air NZ really have got everything spot on. Entertainment is vast and up to date (Bohemian Rhapsody - WOW what a performance from Rami Malek). Service is exactly what you want on a flight of this length. We are booked into Embassy Suites south at LAX - great size rooms with a separate bedroom/lounge kitchen area and bathroom. No need to open a suitcase as we carried overnight clothes etc in our carry on. Our next leg of the journey should be a 10:00am Hawaiian Air flight direct to Honolulu but we receive an email just before we get into bed informing us its been changed and put back very annoyingly to 4pm (although it does mean we can have a lie in). So the following morning we relax over a breakfast in the hotel - have a little walk in the sun before deciding around 11am that we may as well set off for the airport and see if we can find an earlier flight. We check in at Hawaiian Air where they immediately ask if we would like to switch over to a United flight that's leaving at 1.30pm which suits us fine. Our flight (on a rather old, basic 757and entertainment free, other than some free wine) is pretty/ very bumpy the entire way but after 6 hrs we are making a dramatic descent over the island of O'ahu passing over Diamond Head volcano as we turn in to land at Honolulu. Wow, what a welcome to Hawaii. As we leave the plane and enter the jetway one thing hits you straight away. ITS HOT. Way hotter than I was expecting for this time of year and its late evening. We use Uber to take us to our Air BnB for tonight and get an excellent driver who points out lots of things for us and suggests a few places to eat tonight. We are now -10 hours time difference from home - I am so glad we took the trip in two stages with a break in LAX otherwise I think we would feel like the walking dead . We get the key to our apartment in Waikiki and then head on out to a Thai restaurant recommended by the driver -Thai-Lao- and have possibly one of the best Thai meals we have ever had all washed down with a bottle of wine ( BYOB) from the 7-11 on the same block. Next morning we are up bright and early - luckily we have the fantastic breakfast cafe 'Cream Pot' underneath our apartment building. The light & fluffy strawberry pancakes & Hawaiian eggs benedict were amazing. Beautifully fresh & full of flavour. 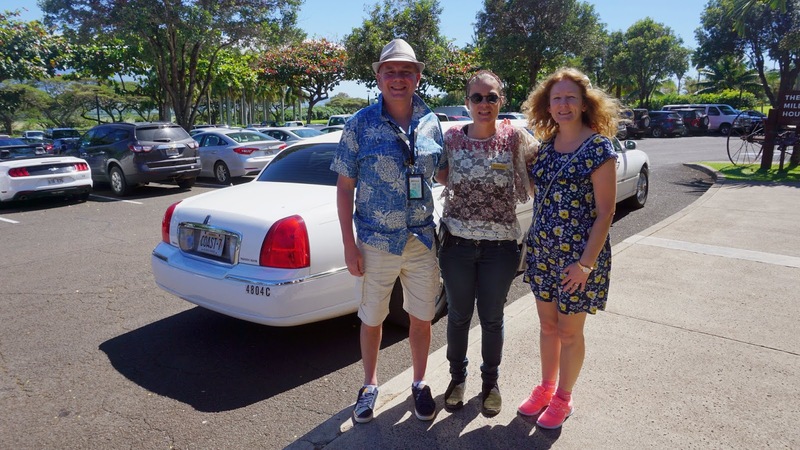 Check out out time here is noon so we have plenty of time to grab another Uber to take us up to Diamond Head and walk to the crater edge - which sounds in theory like a wonderful idea for an early morning trip before the sun gets too hot. 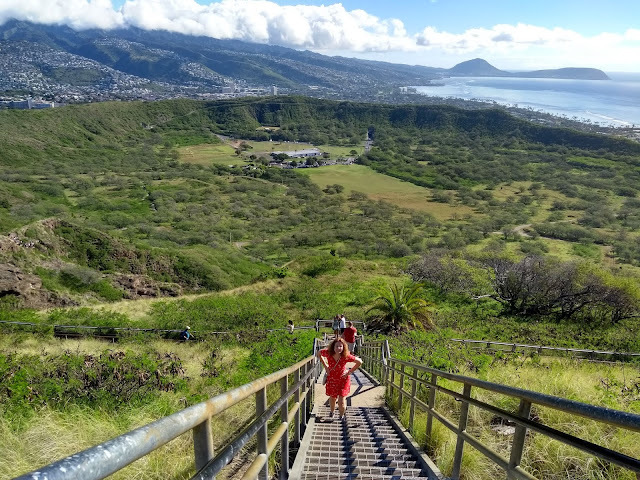 OMG - Diamond Head - you pay a dollar to walk to the top in the hope you dont die half way up - but my goodness it's well worth it. We take a taxi down to Waikiki Beach for a paddle & wander on the beach and a quick shop to stock up on Hawaiian hair accessories (obviously not for Dan) shirts and dresses. Then stroll back to the apartment (actually we miscalculated it was a 2 mile hike) to pick up our cases from the room and take another Uber to the Cruise Terminal. Did I mention its seriously HOT! NCL "Norwegian Pride of America" awaits us and after a traditional Hawaiian greeting we are on the gangplank and boarding for lunch. Dinner tonight was in the Skyline restaurant - here you can be a little more casual a good point on the first day as it did take a while for our suitcases to appear at the cabin. Great meal all washed down with a bottle of Ravens Wood Zinfandel. As we finish the first course we slowly slip out of the port and head towards our first destination the island of Maui. After a good nights sleep we have a lovely breakfast on the rear open deck at the back of the buffet. As soon as we sit down a flash of water just outside the harbour walls signals the presence of humpback whales, a majestic creature breaches the water before crashing back down. No crush for tables though and nice warm weather. There's a little cloud hanging over the mountains which is expected to disappear in a few hours. NCLs Pride of America is currently the only cruise liner that offers this intensive Hawaiian itinerary. 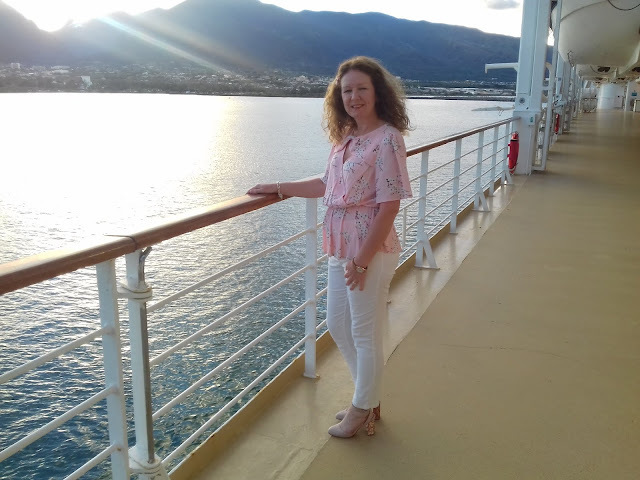 Its home port is Honolulu on the island of Oahu and every Saturday, 52 weeks of the year it sets out to complete this weekly tour of the islands. No time wasted sailing from Vancouver or Seattle and much more time on the actual islands - as most like today include an overnight stopover. We deliberately did not arrange any trips for this first morning just in case we didn't wake up in time or felt dead to the world - so we stroll out of the port and onto the beach alongside to stretch our legs. We have a Zodiac Whale watching tour booked for this afternoon (on reflection I should have booked it later or earlier as I now realise we are basically going to be sat on a large powered dingy in the middle of the ocean with no shade to protect our delicate English skin from the midday sun). Maui is made up of a huge flat valley surrounded on both sides by lush rain forest covered volcanic mountains. The main road just outside the port is where you will find a lot of the local tour operators hawking for business. A few options are available so we decide tomorrow we will find a car & driver and arrange a tour of the valleys and forests. After lunch we take a short drive to the far side of the valley on the south coast for our whale trip. For such a small boat its rather odd that its parked up against a high quayside rather than a pontoon and this causes quite an issue for some of the older guests. But eventually we are all aboard and on our way. Two hours is quite a long time out here especially as the clouds have now cleared and the sun is beating down. We do get a nice soaking every now and again though which keeps us cool but leaves us with a coating of salt. Its hard to look anywhere and not see a water spray up from a Humpback somewhere. 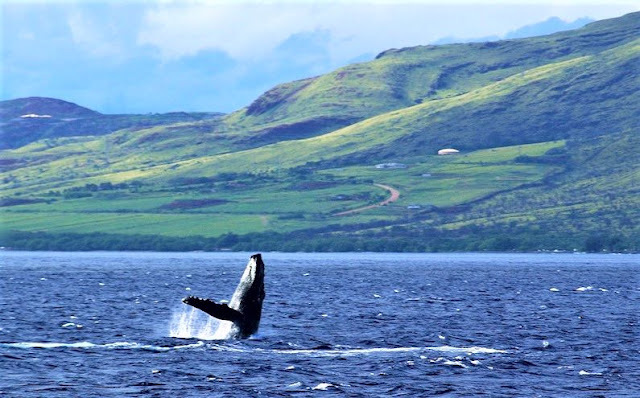 Between December and the end of March the Humpbacks are here in Maui, having left the feeding grounds of Alaska to hang around here to breed - come April they make their way back north. Boats are not allowed within 100 yards of them, so bring a telephoto lens - should they get any closer then all power has to be cut & you wait until the whales move on their way - so if you arrange this trip on your own dont risk it the day your ship is leaving! Liberty restaurant tonight - nice room, not too cramped; though it reminds me of Disney's Hall of Presidents - some seriously OTT silver star spangled velvet curtains (in fact the whole ships public areas have a touch of the White House). Food again is great - this is actually one of the first NCL cruises where we haven't added or been given any specialty restaurants On the Jade's Transatlantic Cruise last November - click here - it was a little repetitive choosing from the menus because nothing has been added on the specialist restaurant menus over the years although lobster has been removed!. However we did get a very nice amount of cash based on our loyalty level, which helps with the bar bill. So as planned this morning we head back out to the port entrance and have a word with one of the drivers touting for business. It doesn't take us long to settle on sharing a Limo driven by Summer of Coastline Limo, Maui with a lovely American couple (who we now know as Rhonda & Jim from Iowa) and are soon joined by three Japanese visitors. 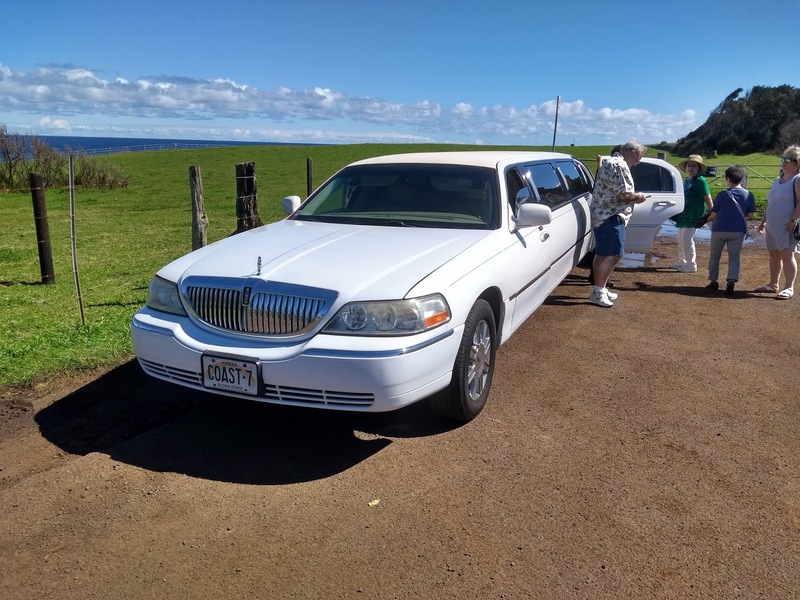 Clean and comfortable Lincoln Limo driven by Summer who gives us an excellent commentary and is on hand to answer any other questions we throw at her. First we head to Ho'okipa beach - Usually a great spot to catch the turtles sunbathing but its a bit too hot for them apparently and dusk or evening would be the better time. We are entertained by a couple of large Hawaiian monk seals trying to clamber up the rocks to sunbathe. Its also a very good area to watch the surfers. In the distance you can see where we will be heading next - up through that gap in the mountains. The Iao Valley State Park on the other side of Wailuku. The gardens and structures all commemorating the diverse cultures who contributed to Hawaii's history, such as Korean, Portuguese, Chinese, and Japanese. The Japanese seems to be the largest with lots of beautiful statues and memorials explaining the history of how they came as workers for the sugar fields. We climb further up the valley to reach the Iao valley state park's main attraction. The climb to the lookout to view the Kuka'emoku. Know as the 'Iao Needle - The traditional name for this 2,250 foot high peak is Kuka'emoku. The peak is known as the phallic stone of Kanaloa, Hawaiian god of the ocean! During periods of warfare, the peak was used as a lookout by warriors. It was here that some of the Maui warriors retreated from the forces of Kamehameha I during the Battle of Kepaniwai. Kuka'emoku is an erosion remnant. It is at the end of a ridge comprised of a denser dike stone eroded by streams and waterfalls. Next we drive off to the beautiful Maui Tropical Plantation. There are various trips available here but we choose just to have a wander around and enjoy a cool beer and some gorgeous quiche at one of the many food outlets. Sugarcane would in the past have been Maui's biggest export and employment but once tariffs and quotas with the mainland took effect it was wiped out completely. Tourism plantations like this are one way of using the land. Though what is going to happen to the 1000's of acres of abandoned sugar cane land we drove through is still a little worrying for the islanders. We say good bye to Summer and head back to the port and by 6pm we are sailing away from Maui on our way to 'Big Island' the island of Hawaii - where we will dock tomorrow morning in the East Coast Port of Hilo. Dinner again tonight in the Liberty Restaurant and we get a great table at the aft windows to watch Maui disappear behind us as we eat.